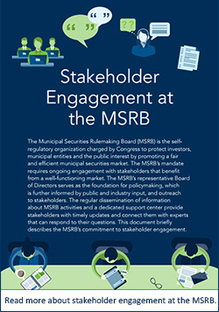 Input from municipal market participants is essential to helping the Municipal Securities Rulemaking Board (MSRB) fulfill our mission to promote a fair and efficient municipal securities market. 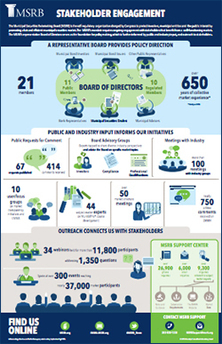 As a self-regulatory organization, our Board of Directors is representative of the diversity of issuers, investors and municipal market professionals in our $3.8 trillion market. Outreach to stakeholders further informs MSRB initiatives. Issuers have many opportunities to tell us how we are doing – and how we can do better. The MSRB engages in an extensive notice and comment process with virtually all its rulemaking initiatives, as well as long-term strategic priorities and other market topics. Public requests for comment ensure all municipal market stakeholders have an opportunity to submit feedback and provide data, expertise and insight that helps shape the policy direction of the organization. Often, a single proposal presents several opportunities for public input, from a preliminary concept proposal to a request for comment on a formal proposal to an additional round of public comment when the proposal is submitted to the Securities and Exchange Commission for approval. Frequently, the MSRB holds one-on-one meetings with commenters to understand their perspectives more fully and will publicly respond to or address issues raised by commenters. Recognizing that many municipal market stakeholders are unable to travel to the MSRB offices in Washington, DC, the MSRB regularly participates in municipal market conferences around the country to facilitate dialogue with municipal market participants. The MSRB routinely provides free live and on-demand educational and training webinars on regulatory and compliance issues, and the use of MSRB market transparency systems. These webinars include question-and-answer periods allowing participants to directly seek clarification from MSRB staff. In addition, the MSRB develops online resources including interpretive guidance, FAQs and educational materials available on the MSRB’s website. The MSRB’s online Education Center provides extensive resources geared toward issuers and investors, including MuniEdPro®, a unique interactive suite of online courses. Of these online courses, the MSRB has designed a complimentary course specifically for issuers, entitled “Being an Informed Municipal Bond Issuer.” Other courses are available for a nominal fee or by subscription. An online comment form also allows the MSRB to capture input about its Electronic Municipal Market Access (EMMA®) website to continually improve this important source of municipal market data and information. From time to time, the MSRB proactively solicits feedback from EMMA users through focus groups and online user satisfaction surveys. If you have suggestions, questions or need guidance, contact the MSRB at 202-838-1330 or MSRBSupport@msrb.org. We provide live telephone customer support on weekdays from 7:30 a.m. to 6:30 p.m. Eastern Time (ET) and email help from 7:00 a.m. to 7:00 p.m. ET. MSRB Support is equipped to answer a broad range of questions and can connect stakeholders to the appropriate subject-matter experts. The MSRB is hosting three Town Hall meetings in 2018 that will give municipal market participants the opportunity to discuss the future of the MSRB. Each meeting will be exclusively in person, and is intended to support the municipal market community by creating a forum to communicate concerns and capture ideas to inform the MSRB's future activity. All are welcome and there is no cost to attend. Details and registration information for each Town Hall meeting is listed below. MSRB Rule G-17 requires dealers to help clients understand the material characteristics and risks of a complex transaction. Read more about the obligations of dealers in complex financings in What to Expect from Your Underwriter. MSRB Rule G-42 requires municipal advisors to have the necessary expertise in the type of transaction to provide clients with informed advice. Read more about the obligations of municipal advisors in What to Expect from Your Municipal Advisor. Issuers considering the use of swaps or other financial products may also want to refer to an advisory from the Government Financial Officers Association on the Use of Debt-Related Derivatives Products. The new tax law also contained another change relevant to municipal issuers with the expansion of 529 savings plans to cover costs associated with tuition for private elementary and secondary education. The MSRB offers up-to-date investor education resources about 529 plans in its online Education Center. For more information, contact Ritta McLaughlin, Chief Education Officer, at rmclaughlin@msrb.org or 202-838-1306. The MSRB maintains an extensive multimedia library of information for state and local governments that issue municipal bonds or anyone interested in learning about the municipal securities market. Download these free and objective resources from the MSRB's online Education Center. The issuer of municipal securities is primarily responsible for the content of the official statement. Federal securities laws impose disclosure obligations and liabilities on other parties as well, depending on their role and responsibilities in the offering. Municipal bond trading surged in December 2017 to highest levels since 2010. Issuance also rose to $66 billion. 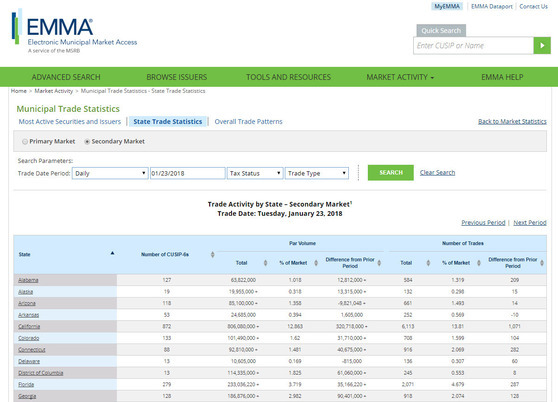 Gain a deeper understanding of municipal market activity in your state with enhanced daily statistics available on the Electronic Municipal Market Access (EMMA®) website. EMMA’s market-wide statistics provide a state-by-state view of municipal bond trading activity and the most actively traded municipal securities and bond issuers. The data presentation is dynamic, allowing users to customize their results based on date range, geographic location, tax status of bonds and type of transaction. It's Your Deal is a quarterly resource guide published by the MSRB to provide objective and useful information to state and local governments that issue municipal bonds. 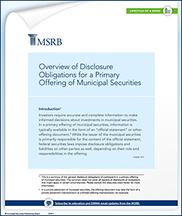 As part of its mission to protect municipal bond issuers, the MSRB regulates municipal advisors and municipal securities dealers, operates the Electronic Municipal Market Access (EMMA®) website, and offers free educational resources in the MSRB Education Center.